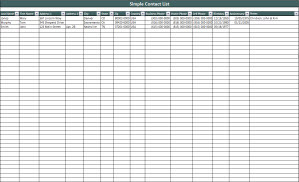 Our FREE Simple Contact List spreadsheet can be used to record your personal or business contacts. This spreadsheet allows you to document addresses, phone numbers, birthdays, etc. You can sort your contacts by last name, city, birthday, etc. This template can be used with Microsoft Word to create mailing labels. See our Mailing Labels document for additional information. Contact labels are great for business mailings or Holiday cards.